Originally developed by Hedi Kyle for her work April Diary, the foundation of the deceptively simple Flag Book structure is an accordion folded spine. 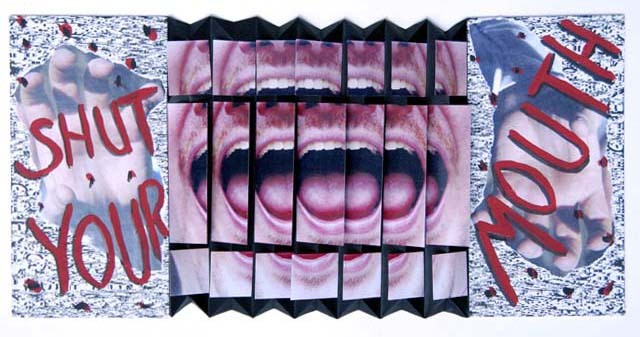 Rows of flags attached to opposing sides of each of the spine’s “mountain” folds allow the artist to fragment and layer a number of complementary or contrasting images and narratives. When read page by page, the viewer sees disjointed fragments of image and text. 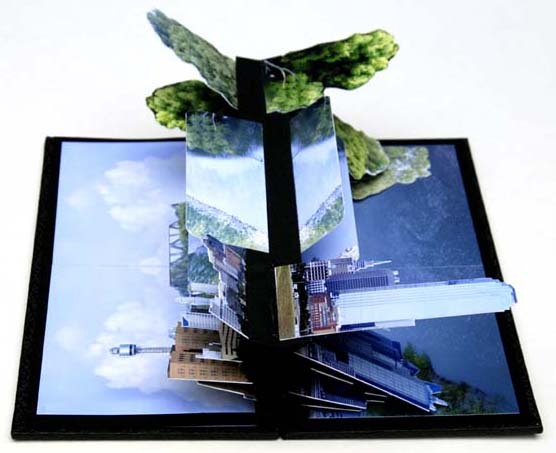 When the spine is pulled fully open, these fragments assemble a panoramic spread. This transformation is accompanied by a delightful flapping sound. The spine and covers provide opportunities for additional imagery. Entry guidelines can be seen here. Black and White dos-a-dos flag book. Accordion spine in black Fabriano Tiziano. White paper flags. End boards covered in black and white map of the City of York. 9.5 x 10.5 cm high, width when fully extended 130 cm. I saw an example of this structure in 1990 and worked out for myself how to construct the book. 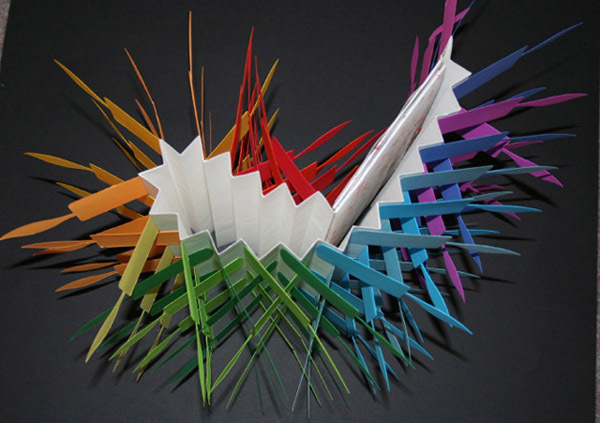 This double flag book structure by Cody Calhoun is made of various handmade paste papers and computer generated text. 17 x 9 x 3 cm (closed), 17 x 9 x 45 cm (open). 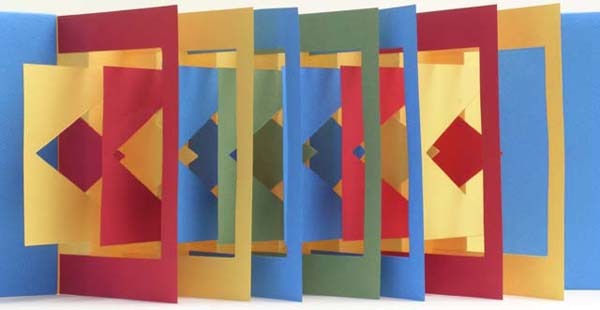 The basic flag book structure was originally learned from samples by Hedi Kyle and the technique was expanded and refined with Karen Hamner at a CBAS workshop in Cincinnati. Photos taken at Wildwood, N.J- blown up to 8x10 and cut down to fit book. Inside top flags (sky) and bottom flags (water) go to the left. Middle flags (docked boats) go to the right. The front side of book has a woman reading on one cover and: boys walking on the other cover. Accordian pleats are of people fishing on the beach. 23 x 13.5 cm. Inside flags (top, middle, and bottom) each flag has different letter on it with stickers and designs for each letter. Painted with stencils and acrylic paint on construction paper. Front covers covered with a collage of paste papers ( some sewn on). Fibers have been placed in the accordion pleats.. 20 x 2 5cm. Technique learned from Barbara Korbduring a book arts course, Bucks County Community College. Inkjet on Mohawk Superfine paper. This book illustrates a poem by Michelle Wong which uses a car crash as a metaphor for the breakup of a marriage 10 x 10 cm. Archival inkjet on Red River and Weber-Valentine papers. This book compares the man-made car environment with the natural environment. 25.4 x 15.2 x 1.2 cm. Same image on both sides of flags made from photographic prints, endpapers are photographic prints, sky photo lifts up to reveal text printed on Curious Metallics – Ice Gold paper, boards covered with black Echizen Embossed paper Echizen Embossed – Black Astrobrights Eclipse – 80lb cover Photographic Prints Curious Metallics – Ice Gold – 80lb text Binders Board. 22 x 11.5 x 3 cm closed, 22 x 38 cm open. Color copies backed with Astrobrights Eclipse black cover, concertina folded at top and bottom to create points, boards covered with paper created by inkjet printing error, red & black paint used for words. Astrobrights Eclipse – 24 lb text Inkjet paper – 24 lb text Color Copies Paint – red & black Binders Board. 21.5 x 11.5 x 1.5 cm closed, 21.5 x 42 cm. Technique learned from Bonnie Thompson Norman of The Windowpane Press in Seattle, Washington during aworkshop held at The Museum of Printing History - Houston, TX, early 1990’s . 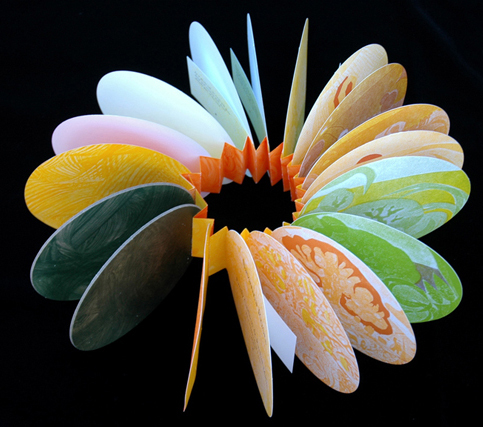 Cut on a die cut machine from a rainbow of card stock paper attached to an accordion spine. Japanese paper covered boards, simple inside message on inside covers “100 Candles” “100 Wishes.” 30 x 14 cm closed, 30 x 40 cm when open with candles in up-right position, 88 cm long when fully extended in hanging position. Originally learned the flag book structure (1995) from Shereen LaPlantz (who took a class from Hedi Kyle, so I figure I leaned it from Hedi once removed!) . Pigment inkjet prints on polyester film, illustration in collaboration with Henry Maron, quote from My Antonia by Willa Cather: “Everywhere, as far as the eye could reach, there was nothing but rough, shaggy, red grass… And there was so much motion in it; the whole country seemed, somehow, to be running.” 2006. 20.5 x 25.5 x 10 cm closed, 20.5 x 40 x 19.5 cm open. 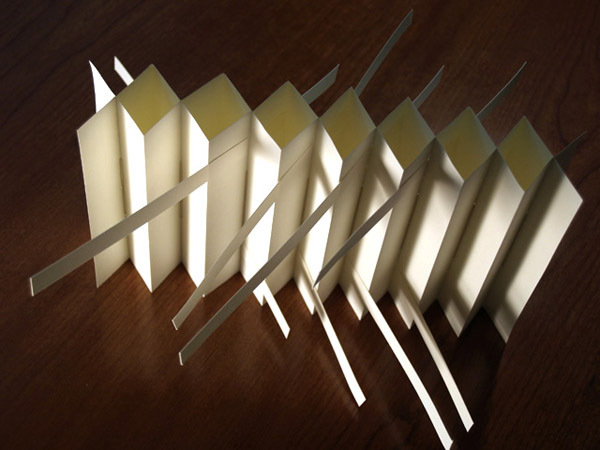 Sculptural model of Canson Mi-Tientes made as demo for workshop at Mississippi State University. 2005. 18.5 x 13 x 1.5cm closed, 18.5 x 56 x 90 cm open. Learned basic structure from Julie Naggs and Melissa Jay Craig. 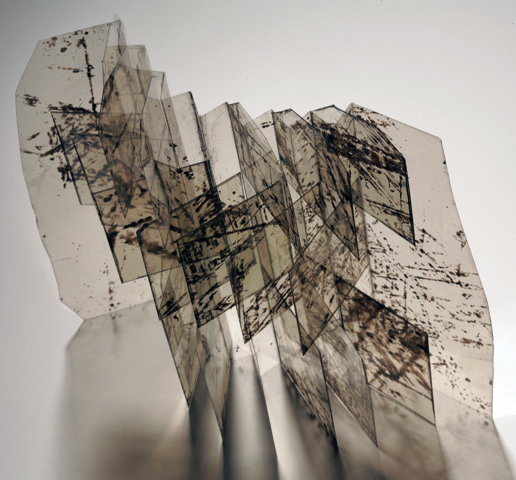 Pigment inkjet print on coated paper and manila paper. The images in this flag book are from a documentary project I did in 2005 with children in Nepal. The inner image, which I took, is a photo of a collage in the hallway of Aastha House, the orphanage where the children live. The cover image, of Aastha House was taken by one of the children, Raj Kumar Chaulayain. 8.3 x 8.3 x 1.4 cm . Self-taught, really - But shout-outs to Asheville Bookworks! 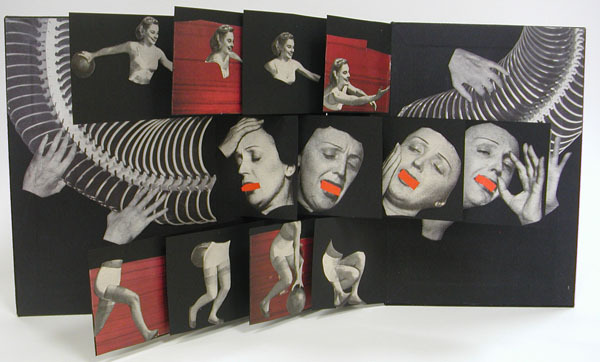 Miscellaneous collaged paper, epson print out, board, cardstock 25 x 18 x 1.5 cm. Taught this structure by Robin Silverberg at Pratt Institute. 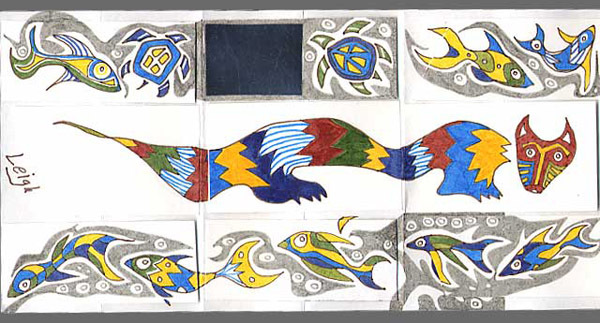 The Native American story of How Porcupine Got His Quills is used to explore flag shapes that become a sculptural book. 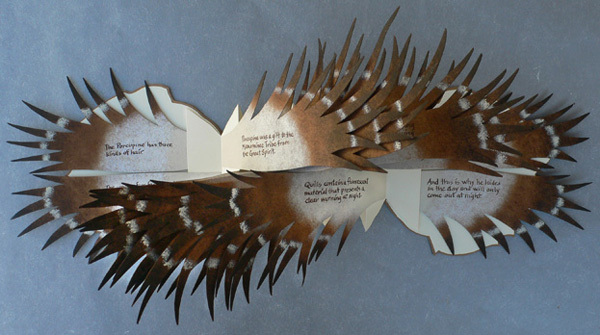 As the reader moves from front to back, the story unfolds on the front side of the flag, while each flag back describe facts about porcupine quills. The book covers and flags are made from 120 lb. sueded, tan paper, hand illustrated with acrylic ink using pen nibs and stencil brushes. The concertina is made from 80 lb. cream, matte paper. 21.5 x 23 x 1.25 cm. Book is named for the coastal town of Manzanita, Oregon, where I took the photographs used as imagery on the inside of the book and the concertina spine. Interior flags, front cover image, and concertina spine were inkjet printed using archival inks on 100% acid free Somerset paper. Cover is book board and purchased handmade paper. 20 x 56 x 1 cm open. Technique learned from The Bonefolder, v. 2, no. 1, Fall, 2005. I often envision the flag book as a movable screen to define space. Light and shadow capture my interest. At Penland I came across pieces of mica with inherent markings. They were transformed into this flag book. One day I hope to commission a similar but much larger structure. 23 x 30 x 2 cm. Photograph by Paul Warchol. Hedi Kyle is the originator of the technique. One-of-a-kind painter’s book: acrylics on acid free commercial book papers glued together with PVA glue to form the thick pages, Tyvek reinforced hinges 23 x 15.5 x 2 cm closed, 23 x 9 cm open. One-of-a-kind painter’s book: Pitt artist pens on acid free heavy weight sketch paper, metallic “mirror” paper, PVA glue 11.5 x 7.5 x .2 cm, 11.5 x 23 cm open . Emily Carlson, Savanna Roots, 2005. The idea for Savanna Roots came in 2001, when two friends from Grinnell College found themselves living in Madison, Wisconsin: Rachel as an M.F.A. art student and Emily as a science writer. 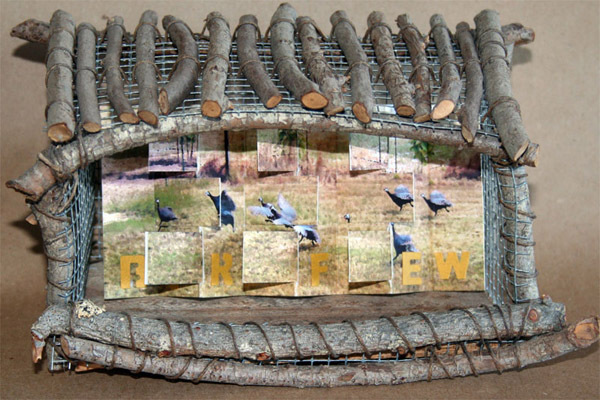 Two years later, Emily researched oak savannas and drafted the story while Rachel offered editorial feedback and created the book¹s structure and stratography images. In the summer of 2004, they printed the illustrations on a University of Wisconsin letterpress and hand-cut the pages. Madison Cut and Dye prepared the covers, which Rachel had painted with acrylics and paste. 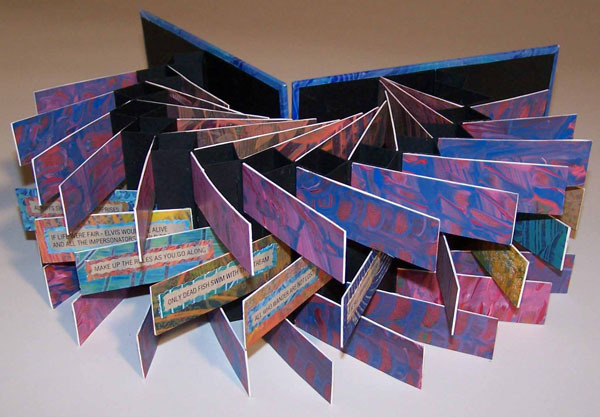 Rachel digitally printed and assembled the books, set in Goudy Old Style, at Kansas State University in 2005. While Rachel and Emily now live in different places, they are grateful for the opportunity to collaborate on Savanna Roots, a book they hope you enjoy as a story and a work of art. Dimensions: 15 x 15 x 2 cm (opens to over 70 cm) Edition Size: 48. Technique learned from Tracy Honn and Jim Escalante, University of Wisconsin-Madison. A miniature flag book featuring original photographs of Barcelona architect Antoni Gaudi’s Casa Mila rooftop sculptures. Archival inkjet printing on Red River paper with Fabriano Ingres for the spine and for the soft wrap around cover. Original poem written by the artist. 7.5 x 7.5 cm, opens to 57 cm long. Technique learned from Alicia McKim at Paper Pleasures in Denver, Colorado. The Weavers of Broome Street is a Three- Generations Production based on a memoir/short story written about my father’s New York boyhood; it is illustrated with one of his memory drawings of the story location and photographs taken by his grandson seventy-five years later. Double-sided, pigment inkjet prints on Plainfield Cover Stock. 21 x 22 x 1 cm open, 21 x 52 cm open. Learned from Sandra Semchuk at the Emily Carr Institute of Art, Design and Media, Vancouver, BC. My Hindi Primer includes alphabet flags (for 21 letters of the Hindi alphabet) made from out of print children’s lesson books in my private collection. I lived in India for 7 years over 40 years ago. Japanese paper covers, accordion folded canson paper and ink jet prints. 20 x 12 x 1.5 cm. Technique learned in my Libros Book Arts study group here in Albuquerque. Digital Print on tracing paper and BFK paper. 15 x 29 x 8 cm. 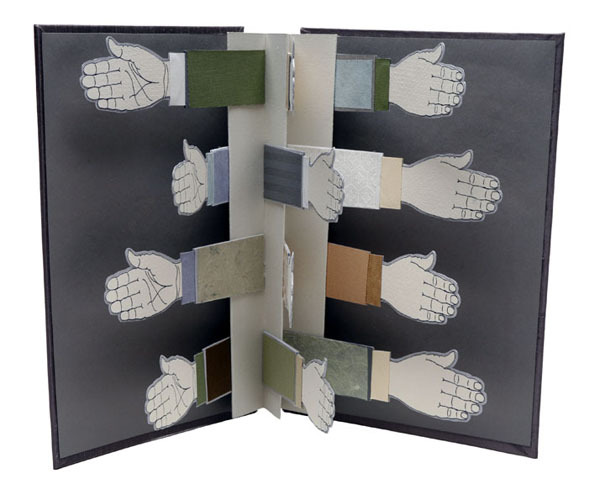 Technique learned from various books on bookbinding but mainly from Cover to Cover by Shreen LaPlantz. Boards covered in japanese silk cloth with red leather onlays. Interior created with black Fabriano Ingres paper on which I applied a photomontage. 20 x 14 x .5 cm. I learned the basic structure from the book Creating Handmade Books by Alisa Golden. Image of guineas in action is printed on both sides of Kodak Matte heavyweight paper using a Canon i9900. I wanted to use the sculptural aspect of the structure so I cut slots and the flags go through from front to back but are only glued on the side of the panel on which they rest. Each flag does double duty one image in the front and one in back. The “cover” is made from twigs, hardware cloth and jute twine.11.5 x 20.3 x 11.4 cm. Technique learned the structure online. 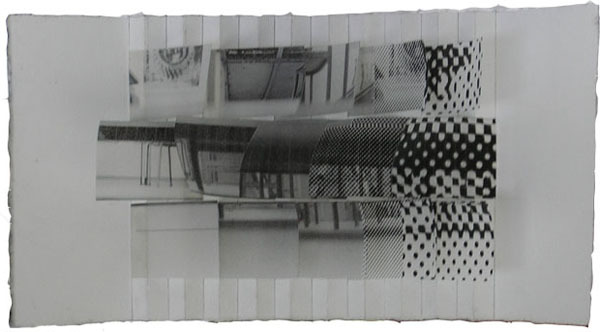 Inkjet Print on Acid-Free Paper Other Materials: Velcro I choose flag book structure for this work. It is a very dynamic construction. I had been struggling to find the right content for this special form. Finally I became inspired while organizing some old documents. The cover of this book is created from scanned images of my expired passport by which I entered the States. On one of the corners, you can find the stamp I received 13 years ago when I left my own country. 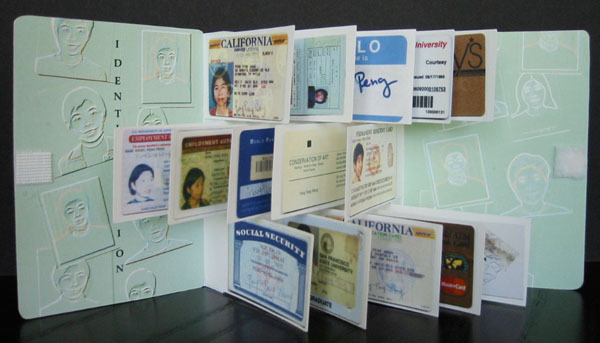 The book opens up with my all sorts of identification cards with which many Americans and more especially all immigrants are familiar. In some sense, this is a history book—” my history. Still, I find it somewhat ironic to see myself as an individual being constructed (or destructed) and finally presented by tiny pieces of cards. P.S. All numbers on the cards have been altered to protect my true and precious identity. Edition of 6. 14..3 x 10.2 x 1.27 cm. Technique learned from Jody Alexander at Foothill College, CA. Double-sided flag book with random paper flags inserted through slits where concertina folds meet. The two paper concertinas are sewn together with a simple pamphlet stitch. 14 x 19 x 27 cm opened. Technique learned from Hedi Kyle. Flag book structure, printed on card stock and cartridge paper, using an Apple G4 computer and Canon MP170 printer. This book was made in Scotland, while helping my mother-in-law clear out her family home near Glasgow, after her last remaining sibling died. Her brother ran a piggery there and as we sorted through some 65 years of memorabilia she told me family stories. This book is for Anna and her brother, Robert. 21 x 52 x 1.5cm.